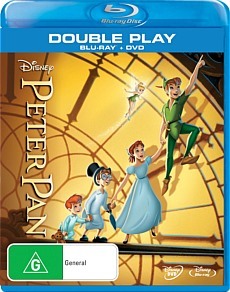 Peter Pan Blu-ray Review Peter Pan is such a simple film, yet it is also so calming. Disney has been creating animation classics since it released Snow White and the Seven Dwarves, its first feature length animation back in 1937. The revelation of blu-ray has given Disney classics a new life and enhanced the beauty of each film. Peter Pan is one classic to receive this treatment. First released in 1953 and based on J. M. Barrie’s play of the same name, Peter Pan is the tale of the boy who never grew up. Wendy, John and Michael Darling (voiced by Kathryn Beaumont, Paul Collins and Tommy Luske) are three children living happily in their world of fairy tales and being looked over by their beloved dog, Nana. That is until their father demands that Wendy move out of the nursery the next day and grow up. Before she does, the boy from their fairy tales, Peter Pan (voiced by Bobby Driscoll) turns up looking for his shadow and takes the three to Neverland. Here the three children meet Peter’s Lost Boys and must not fall victim to the evil Captain Hook (Hans Conreid). Animation has come a long way since the 1950’s, but there is denying that Peter Pan has not lost any of its beauty and magic. Visually it is still as beautiful as ever and time has been very kind to it. The colours are magnificent and enhanced by blu-ray. The story is completely timeless, as it is as relevant now to children and adults as it was back then. It is a story of childhood innocence and the idea that inside you never really grow up as long as you believe in magic. Both adults and children appreciate the magic and beauty of the story. Peter Pan is such a simple film, yet it is also so calming. The featurette “Growing Up With Nine Old Men” is absolutely fascinating. It is a short film about the nine chief animators for Walt Disney. All of the children of the late animators are interviewed about their childhood with their Disney fathers. It is so intriguing hearing about what all these men were like at home and whether they lived a charmed life. It was also incredible hearing that, like Disney himself, many of these men also had a running small train in their backyards. “You Can Fly: The Making Of Peter Pan” is also very interesting and contains interviews with Kathryn Beaumont who was the voice for Wendy.